This contest matters. It is the election for the most powerful leader in the Western world, and some – like the Economist Intelligence Unit – regard Donald Trump as a major risk to global prosperity and stability. Also, as citizens of one of the world’s oldest democracies, Americans like to think that the United States provides an influential role model for how elections should run in other countries. The Electoral Integrity Project (EIP), founded in 2012, provides an independent evaluation of the quality of elections worldwide. The EIP’s results have been published in several books, including my own Why Electoral Integrity Matters and Why Elections Fail – books that focus on comparing the quality of elections, understanding why problems arise, and diagnosing what can be done about these flaws. Super Tuesday in Stillwater, Oklahoma. Standards remain uneven across the country. 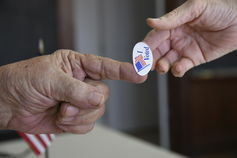 The Pew Center’s 2012 Election Performance Index, for instance, suggests that states such as North Dakota, Minnesota and Wisconsin performed relatively well against a range of quality indicators combining voting convenience and electoral integrity. Other states, including California, Oklahoma, and Mississippi demonstrated noticeable shortfalls. It was no different during the 2014 midterm elections. The news media reported a range of problems on polling day – some trivial, others more serious. It is unclear whether these arose from accidental administrative mistakes or intentional dirty tricks. Much of Trump’s visibility comes from exploiting his advantage in attracting free social media and spending less on TV airwaves than any other major candidate. He commonly claims that his organization is more self-funded than most presidential campaigns, without support by a super-PAC. This may appeal to voters who are suspicious of the role of money in American elections and of the honesty of politicians who are seen to be in the pockets of rich donors and corporate interests. In the 2012 National Election Survey, for example, when the public was asked whether ‘Rich people buy elections’, two-thirds of Americans agreed with this statement. New evidence that gives insights into this issue has been gathered by the Electoral Integrity Project. This independent research project is funded by the Australian Research Council’s Laureate award with a team of researchers based at the University of Sydney and Harvard University. Denmark, Finland, Norway and Sweden are at the top of the ranking, all scoring over 80 on the 100 point PEI Index. Several democracies from diverse regions and cultures – for example, Israel and Canada – are ranked in the middle of the pack. But the U.S. scores 62, a full 24 points lower than Denmark and Finland. The UK also performs fairly poorly, along with Greece and Australia. One reason for this is that proportional electoral systems – which translate votes into seats on a proportional basis – usually tend to score higher as they provide more inclusive opportunities for smaller parties. All of the Nordic countries, for example, use a proportional system. Other weaknesses concerned whether electoral laws were unfair to smaller parties like the Green Party, favored the governing party, or restricted voter’s rights. Campaign finance – for example, whether parties and candidates had equitable access to public subsidies and political donations – was also seen by experts as a problem.